The 18th Annual David Rice Memorial Angel Run and Walk will be held Saturday, April 27, and will begin at 8 a.m. on Holy Angels’ campus. The opening ceremony will kick off with special guest, Miss Wheelchair Louisiana, Karen Roy. Runners and walkers will travel through Long Lake neighborhood then back to Holy Angels’ campus for a celebration. Holy Angels is a residential training campus for individuals with intellectual and developmental disabilities nestled away in Southeast Shreveport. When the first 2001 Angel Run took place, it had only a few hundred participants, consisting mostly of Holy Angels’ families. Runners and walkers joined alongside Holy Angels’ residents to honor the memory of the young man who influenced the lives of everyone around him. The one-ofa-kind 5K quickly turned into an annual event for Holy Angels. This year’s Angel Run and Walk will be complete with an opening ceremony, a fun-filled route, and an exciting afterparty. Participation steadily increased, and the race now has more than 1,000 participants from all over the community. The celebration at the end of the race will feature vendors from around the area with fun-filled, free activities. Enjoy balloon animals by CeCe the Clown, the Jubilee Petting Zoo, Little You Yoga, Face Painting by Becky, About Faces Caricatures, Chris Davis Massage Therapy, Duvall Amusements, a puppet show by Calvary Baptist, and a tutu station in partnership with Girls on the Run. Food vendors include Taziki’s, Counter Culture, Holy Angels Cookies, the Holy Angels Snow Cone Shack, and the Knights of Columbus will be grilling hamburgers, hot dogs and sausage. This 5K is unique in that it is one of the few races where participants walk alongside the individuals whom they are racing to support. Holy Angels’ residents and clients participate in the race with 86 cents of every dollar raised going directly to care for these incredible individuals. 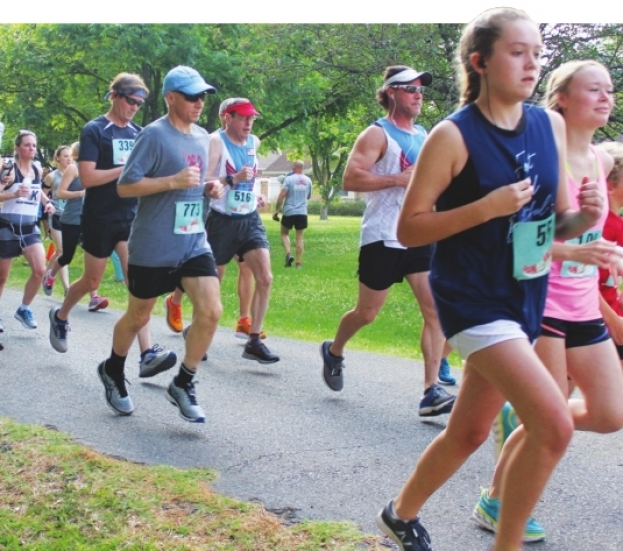 Some travel the entire 5K while others take a shorter route, staying on Holy Angels’ campus. Each resident and client receives a medal and enjoys tasty food and live music provided by a local band. To register for Holy Angels’ 18th Annual David Rice Memorial Angel Run and Walk, please visit SportSpectrum. com. Registration for the event is all online through SportSpectrum.com. Holy Angels is an independent, nonprofit facility serving individuals with developmental and intellectual disabilities ranging in age from newborns to senior citizens. Holy Angels cares for approximately 185 individuals with disabilities from over 15 states and employs about 300 staff. Holy Angels’ 64-acre campus is comprised of 13 group homes, three dormitories, indoor and outdoor pools, gift shop, conservatory, Autism Center and the award-winning AngelWorks Day Program. Holy Angels’ residents and program participants receive basic adaptive skills training, vocational education, community and social integration. The organization encourages healthy lifestyles through recreational activities. Alex Einerson is the communications coordinator for Holy Angels.